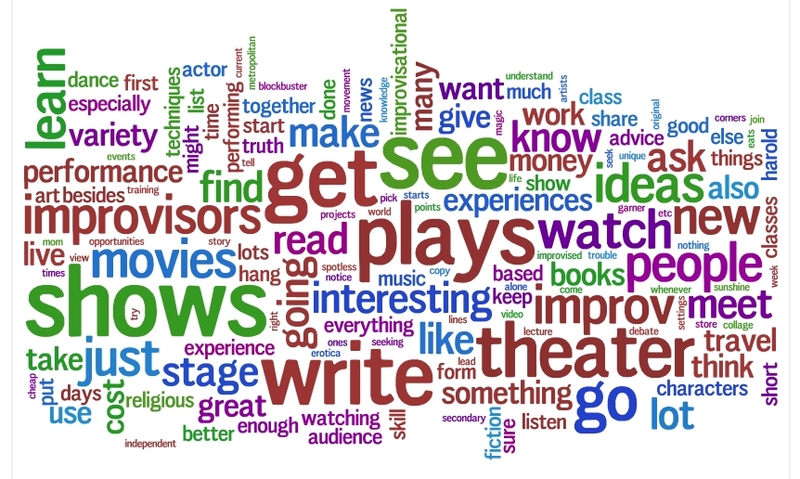 Go to the theater – don’t just watch improv shows, get out to the regular theater and watch some plays. You might not think of yourself as a fan of theater. Get out there and see a variety of plays, contemporary plays, classic plays, Shakespeare, original plays and one person shows. You will get some great ideas for characters, situations and techniques to use in your shows. When you think you have seen all kinds of theater, keep going, but instead of watching plays, see everything else. Go see performance art or dance or clown shows. Watch live music or opera. Go see stand up or variety shows. Go see a lecture or watch a religious ceremony. Within an improvised show, you can put anything else that might work on stage. As Del use to say, “Harold eats everything,” so make sure to feed Harold a diet with lots of variety. Read books – like watching theater, reading books should give you lots of ideas for your scenework. You should read both non-fiction and fiction. You will glean ideas about characters, settings and story lines, store up lots of details and specifics that will spill out into your scenes. Watch movies – especially movies that have unique and interesting points of view or use novel storytelling techniques. If you live in a major metropolitan center, seek out smaller, independent movies that have a certain buzz around them. You will want to see some bigger blockbuster movies too, so that you understand what is happening when someone starts a scene on planet Pandora. But if you want to get interesting ideas for how to put together shows, you want to see movies like Short Cuts, 500 Days of Summer, Memento, Pulp Fiction, Magnolia, and Eternal Sunshine of the Spotless Mind, the more unconventional a movie is, the better. Know the news – find a good source of news and consume it regularly. Listen to NPR on the way to work. Read a good newspaper. Find some interesting podcasts. Read books about current events. Find a magazine with in-depth, thoughtful articles. If you are going to get onstage and take suggestions from an audience, you better know what’s going on in the world. Develop a secondary performance skill – learn to play music or sing. Learn to perform magic. Study dance, clowning or some other movement based art form. Write – keep a journal. Write short plays or sketches. Write character monologues. Write erotica. Write top 10 lists. Write jokes. Write your mom. It doesn’t matter, just write. Meet new people – don’t just hang out with other improvisors. Find some other channel to meet new people and keep a line open to old friends. Learn how to start conversations with strangers and do it often. Hang out with your weird relatives. Make a point to ask about their lives and their experiences. Do they believe something different than you? Ask them to tell you about their religious or political views or their philosophy of life. Make them tell you all their best stories. Don’t debate them. Just listen, and ask questions. Have new experiences – try something you have never tried before. Learn how to shoot a gun or ride a motorcycle. Ski. Take a cooking class or join a volleyball league. Like a writer, the more life experience you have, the more you have to share on stage. As a bonus, it will also help you meet new people. Travel – travel whenever you can. Get to know the corners of your country, but travel abroad as well. When you do, make sure you meet new people and ask them all about themselves. There are a couple things I notice about this list after writing it. First, I like to give advice, but really I’m giving advice to myself. Some of these I do, some I wish I had done more, some I’m working on right now. But they are all things I want to do more often. Second, a lot of these cost money. Many improvisors have trouble scraping together enough money for classes let alone all these extras. However, a lot of these don’t cost money or can be done cheaply. Besides you won’t have enough time to do all of them. Pick a few that you do think you can work into your routine and that don’t cost a lot. These are just some ideas to get you thinking. This is a great list for improvisors to explore the world outside of improv (which can become all-consuming). I really love #2* – catching theatre, music, and live cultural & performance events around you helps support other artists who are passionate about what they do. I just don’t get how some folks expect people to come out to their shows when they never take the time to catch anyone else’s show. I think that a lot of the things mentioned on the list are ultimately about knowing yourself and other people better. Challenging yourself to learn new things and have new experiences helps stretch those learning muscles and broadens our boundaries. Delving into great works of art, literature, and film and keeping up on news helps give us some insight into people and the human condition. Beautiful! Every improvisor should look at this. Thank you! This is a great post. I recently had a baby and so my time spent improvising has been greatly diminished. But I have been experiencing all sorts of new things and learning new skills (I may hold the record for speed diaper changing in the state of Oregon). Also I’ve been writing every day about this experience at improvisingfatherhood.com. As a result when I do get out to do a show, even though I have not practiced with my group in months, I tend to have pretty great shows. I think this is because of all the other things I am doing besides improvising.